Shane is the hometown hero, the soldier who came home alive, the beefy cop with the K-9 partner, but his demons still haunt him from the hell he endured in Iraq. To everyone else, he is a survivor, but his nightmares tell him differently. Then, like a dream, there she was, literally falling at his feet and like Cinderella, she flees, leaving behind something that is hers and only hers…and Shane is determined to meet this mystery woman. 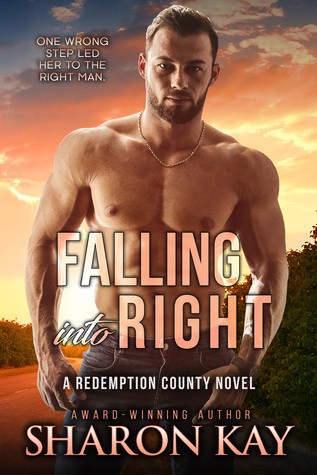 Sharon Kay’s FALLING INTO RIGHT is one of “those reads.” You know the ones, your heart melts, your funny bone chuckles and the animal lover in you is in 7th heaven! Oh, and your urge to toss rotten tomatoes at the villain will make you wish you had a hard, fast and low curve ball in that throwing arm. Both Becca and Shane know pain, loss and not being truly understood, maybe that’s why their chemistry is so perfect! Maybe Fate just knew that Becca would be needing a man like Shane and a dog like Denver to stand by her when a stalker decides she has not suffered enough for her past. Once again, Sharon Kay brings her “A” game to the reading table and once again, sweet romance is up for grabs, but only after the tail wagging co-hero takes a bite out of crime! I am voluntarily reviewing an ARC edition from Sharon Kay!